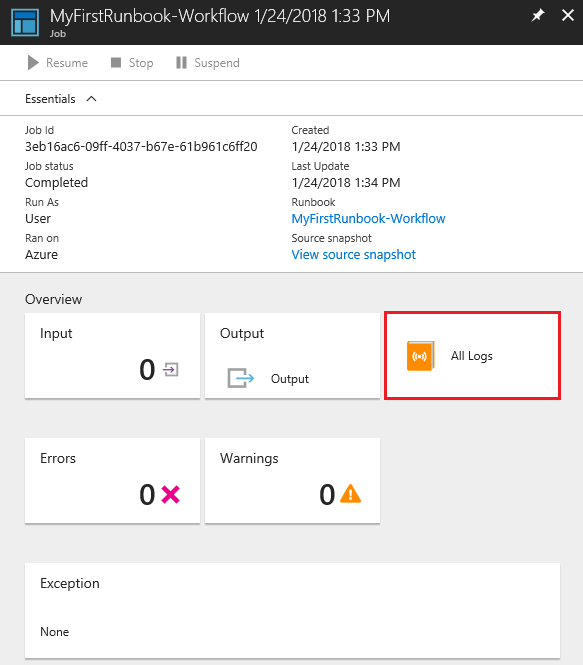 This tutorial walks you through the creation of a PowerShell Workflow runbook in Azure Automation. 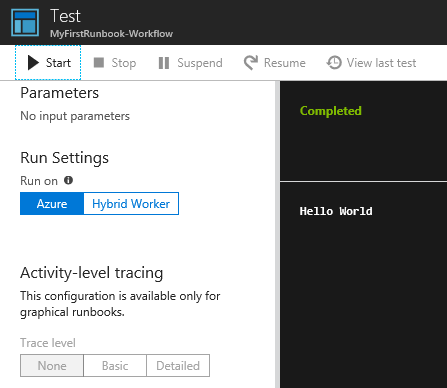 You start with a simple runbook that you test and publish while explaining how to track the status of the runbook job. 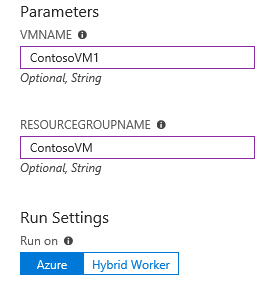 Then you modify the runbook to actually manage Azure resources, in this case starting an Azure virtual machine. Lastly you make the runbook more robust by adding runbook parameters. Create a new runbook by clicking on the + Add a runbook button and then Create a new runbook. Give the runbook the name MyFirstRunbook-Workflow. 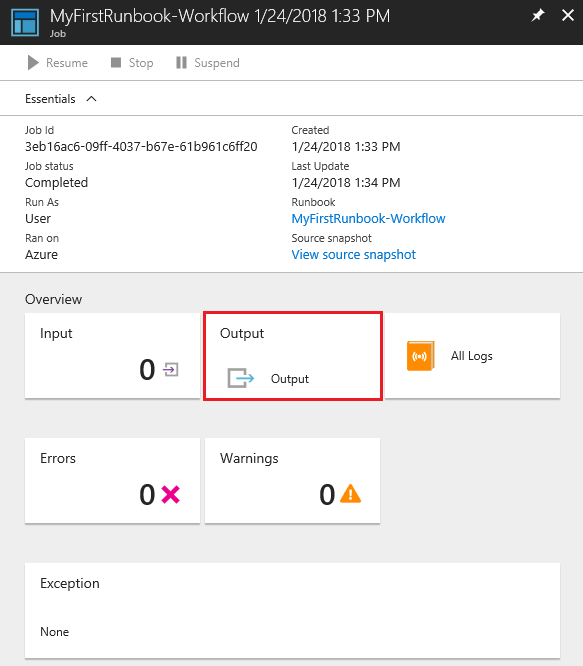 In this case, you're going to create a PowerShell Workflow runbook so select Powershell Workflow for Runbook type. You can either type code directly into the runbook, or you can select cmdlets, runbooks, and assets from the Library control and have them added to the runbook with any related parameters. For this walkthrough, you type directly into the runbook. Your runbook is currently empty with only the required workflow keyword, the name of your runbook, and the braces that encases the entire workflow. Type Write-Output "Hello World." between the braces. Click Start to start the test. This option should be the only enabled option. The job status will start as Queued indicating that it's waiting for a runbook worker in the cloud to come available. It moves to Starting when a worker claims the job, and then Running when the runbook actually starts running. The runbook that you created is still in Draft mode. You must publish it before you can run it in production. When you publish a runbook, you overwrite the existing Published version with the Draft version. In your case, you don't have a Published version yet because you just created the runbook. Scroll back to the right to view the pane for MyFirstRunbook-Workflow. you just want to start the runbook so click Start and then Yes when prompted. Click All Logs to open the Streams pane for the runbook job. you should only see Hello World in the output stream, but this view can show other streams for a runbook job such as Verbose and Error if the runbook writes to them. Close the Streams page and the Job page to return to the MyFirstRunbook page. Click Jobs to open the Jobs page for this runbook. This page lists all of the jobs created by this runbook. you should only see one job listed since you only ran the job once. You can click on this job to open the same Job page that you viewed when you started the runbook. This action allows you to go back in time and view the details of any job that was created for a particular runbook. You've tested and published your runbook, but so far it doesn't do anything useful. You want to have it manage Azure resources. It can't do that though unless you've authenticated using the credentials that are referred to in the prerequisites. You do that with the Connect-AzureRmAccount cmdlet. Open the textual editor by clicking Edit on the MyFirstRunbook-Workflow pane. Position the cursor on a blank line between the braces. You might need to update your modules even though you have just created a new automation account. Click Start to start the test. Once it completes, you should receive output similar to the following, displaying basic information from your account. This action confirms that the credential is valid. 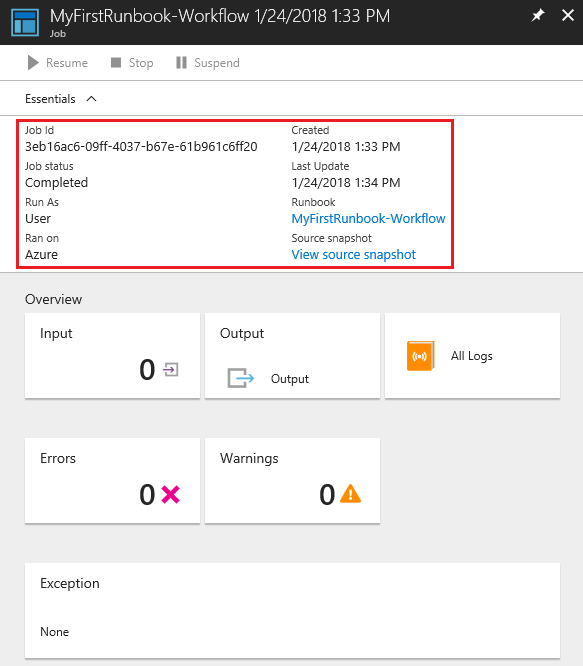 Now that your runbook is authenticating to your Azure subscription, you can manage resources. you add a command to start a virtual machine. You can pick any virtual machine in your Azure subscription, and for now you're hardcoding that name in the runbook. If you're managing resources across multiple subscriptions, you need to use the -AzureRmContext parameter along with Get-AzureRmContext. your runbook currently starts the virtual machine that you hardcoded in the runbook, but it would be more useful if you could specify the virtual machine when the runbook is started. You add input parameters to the runbook to provide that functionality. Add parameters for VMName and ResourceGroupName to the runbook and use these variables with the Start-AzureRmVM cmdlet as in the example below. Save the runbook and open the Test pane. You can now provide values for the two input variables that are in the test.